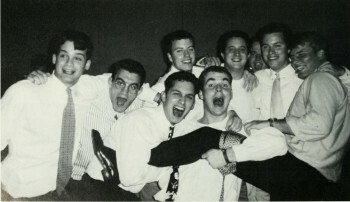 Gamma-Psi Chapter of Lambda Chi Alpha at Lehigh - Share Your Gamma Psi Stories! Share Your Gamma Psi Stories! It's been awhile since we have seen an influx of alumni updates on our website. With so many brothers in our database from every decade, we know that there are some great stories and memories floating around out there. Here is another chance to capture these memories forever in our archives. We have four questions here for you to answer and send back. No answer is too long or too short, we just want to hear from you. You can either submit you answers on the website or send them directly to our managing editor and they will be considered for future publications. Photos are always encouraged as well! Consider these four questions and get back to us. Describe the best Gamma Psi party you attended as an undergraduate. Describe the best road trip you ever took with other Gamma Psi members. What is the one memory you have shared or that you plan to share with your grandchildren about Gamma Psi?